You know what? I feel like it has been absolutely forever since I have shared a piece of furniture with you all. And, it sort of has been. Which, is completely unusual for me. This past weekend, I got back into the painting groove and finished a few custom orders. One being this lovely, vintage, two-toned sideboard. I am so super thrilled with how it came out, but can I just share the ridiculous struggle of trying to remove layer upon layer of poly from the top so that I could stain it? Kinda nightmarish and involved two attempts at stripping the poly off, along with tons of sanding and cleaning. The majority of the sideboard is painted in Peacock. It is truly a favorite color of mine and one that has made a strong appearance in my own home in the past. I just very lightly distressed the sideboard, for a slightly worn feel. For the top and doors I used a deep Jacobean stain. I think the darker stain mixed nicely with the bold paint. 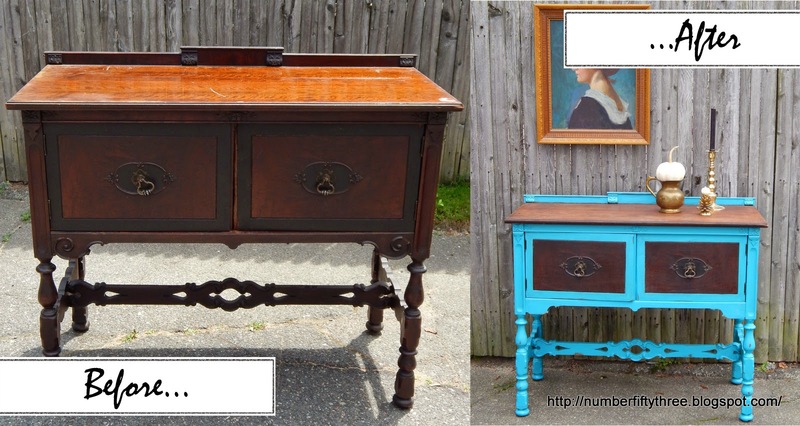 Stunning makeover Angela - I love the turquoise and dark stained wood combination! what a gorgeous piece- the details on the doors are amazing! looks great Angela! I have an old sideboard in my kitchen that the previous owners used marine varnish on...I'd love to paint it, but am not looking forward to stripping off that finish! What a pretty piece...love the makeover you gave it Angela! Love how the bright blue goes with the wood! It looks lovely!! !